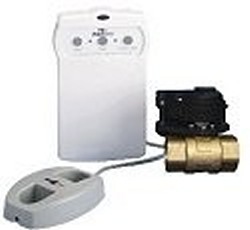 Finally a reliable, super easy to install leak detection and shut-off valve system. The Aquagate is battery powered, (Qty 4, AA batteries) so there is no electrical wiring needed. Just mount the box (very small, 5" x 7") put the sensor on the ground where you want to monitor for water, and install the valve (1" FPT, brass) in the water line you want to shut off. If there is ever a leak and you are away from him, it'll turn off the water preventing thousands of dollars in damage. You can also protect more than one location by daisy-chaining more senors. Comes with 1 sensor with a 15' cord, and about 25' wire for the valve. Imported. Perfect for irrigation, basements, main water lines, coolers, and anywhere a broken water line or stock on water valve will cause damage.